Tiais canorus is a member of the genus Tiaria, and are certainly one of the most attractive birds in the Neotropics (Neotropical birds). Its natural habitats are subtropical or tropical moist lowland forests, moist montane forests, shrub lands and degraded former forests. The name Cuban grassquit comes from Latin meaning “grass”. Grassquit are recognized as a tanagers and are closely related to Darwin’s Finches of the Galapagos Islands. The Cuban grassquit (Tiaris canorus) is endemic to Cuba (Birds of Cuban). Grassquits are regularly found in many areas of the world. The colors of the males and females are different. The Cuban grassquit is small with olive upper parts, and conspicuous yellow crescent divide face and breast (Birds of the West Indies). 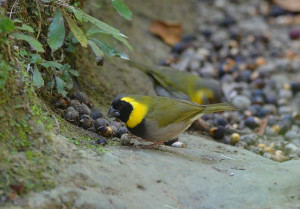 Males are characterized by their black mask and breast patch that strongly contrast with the orange and yellow collar that reaches to just behind the eye and their gray crown and belly. Females are similar in their color patterns but have a more washed out version of the males colors with fewer mark on their faces. The Cuban grassquit is mostly always spotted in pairs. It is a small bird with a voice that is shrill and raspy. Its song can be expressed as “chiri wichiwichi, chiri wichiwichi, chibiri wichi wichi.” This song resembles the song of the Bee hummingbird (wild life of the Caribbean) (Neotropicals birds). Their breeding biology is somewhat different than most Finches “The full courtship ritual is often only performed by new pairs. It involves duet singing by both sexes the male, the male courtship feeding the female, and when ready to mate the female will crouch low, lifting her head and tail to solicit copulation from the male. Established pairs often skip some or all of the full ritual and get straight down to business perhaps with just with a brief song and or courtship feeding prior to mating” (Aussiefinch). Female grassquits are active and aggressive birds. They can even be induced to attack certain color and marking patterns that resemble competing birds (Dias R). Females have yellow faces with few markings; their color patterns, as previously described, are a somewhat washed out version of the males. These male patterns are conspicuous secondary sexual traits which often trigger competitive interactions that can decrease male survival rates (Costal, Fabio). Females most often choose highly competitive males in order to access wider territorial resources (Manica). Females also choose males that have lower levels of parasites and that are in better physical condition. This increases the chance of having a higher survival rate in their offspring (Costa). Male Grassquits have a large black mask and a bold yellow orange collar. The size of the black patch on the breast increases with age on male (Garrido). Single males are very aggressive (Manical). Males defend territories of very different sizes, ranging from 13.0 to 72.5 meters. Although when it comes to dealing with other predators, they will form a strong bonds with surrounding males. They often cooperate to attack other Cuban Finches and even other species that have invade their territories. 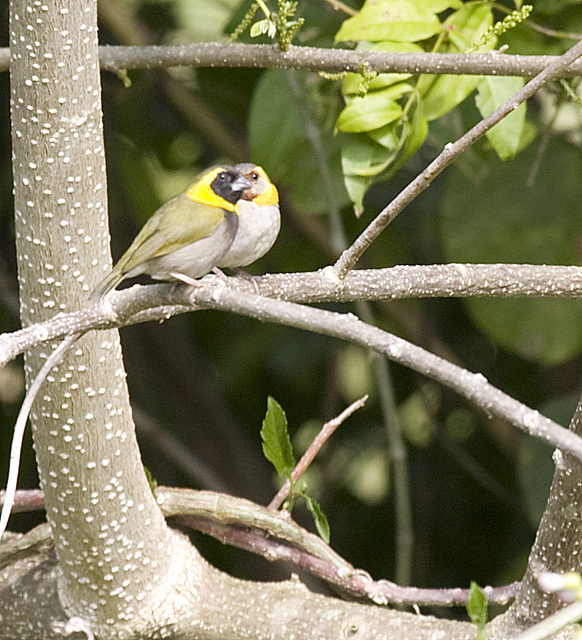 They especially target birds that have even a small amount of yellow in their plumage (Indiviglio). Cuban grassquit eats various kinds of fruits, seeds, and tender shoots (Garrido). The Male builds a nest typically low in the vegetation. The Cuban grassquit nest all year long. The typical clutch size is between two and four eggs that are,white with brown spot. The brown spots are concentrated at the wider end of the egg. The female alone incubates the eggs and broods the young for the first half of their pre-fledging period (Aussiefinch). The incubation period lasts for 11- 13 days, after which both parents feed the nestlings. After the eggs hatch and the nestlings grow enough to reach a fledgling state the female often “renests while the male continues to feed the fledging for up a month longer”. Four out of seven nests were found within the male territories and observations indicated that both sexes invest equally in caring for nestlings (Almeida). For most birds in the Neotropics nest predators are the major cause of nest failures (Carvaibo). Cuban grassquits live in the subtropical parts of Cuba. They are one of the most frequently captured Neotropical migrant land birds (Boal). Despite only being first detected in the region in 1989, this species may be more common in the region than previously believed. The species primarily inhabits semiarid country but also lives in pine undergrowths, in edges of woods, in bushy areas, in shade coffee and citrus plantations, in farms with much shrubbery and in coastal regions to mid elevations (Bond). 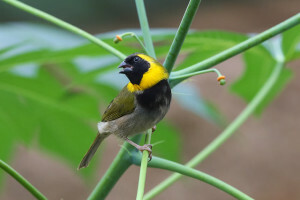 The Grassquit has declined in Cuba, but the bird was introduced into New Providence and the Island of Bahama where it is fairly common today. Cuban Grassquit (Tiaris Canorus) – Neotropical Birds. Overview -. N.p., n.d. Web. 28 Sept. 2015. Gmelin, S. Cuban Grassquit (Tiaris canorus). Aussie Finch Breeder. N.p., n.d. Web. 12 Oct. 2015. Holmes, David. 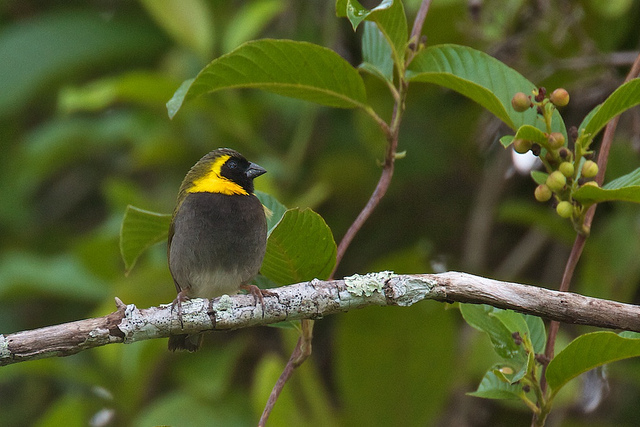 The Cuban Melodious Finch. Finch Information Center. N.p., n.d. Web. 12 Oct. 2015. Howell, Steve N. G., Ian Lewington, and Will Russell. Rare Birds of North America. United Kingdom. Princeton University Press: 2014, Print. Indiviglio, Frank. 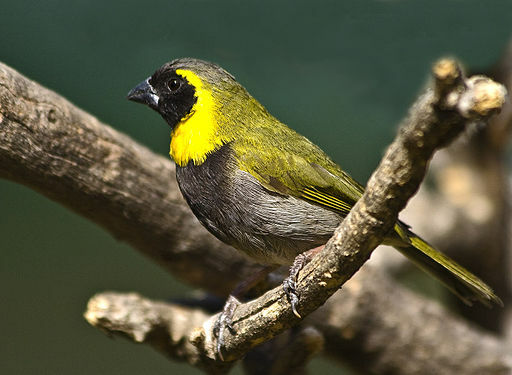 Keeping and Breeding the Cuban Finch or Cuban Melodious Grassquit. That Bird Blog. N.p., 06 July 2011. Web. 28 Sept. 2015. Raffaele, Herbert A., and James W. Wiley. Wildlife of the Caribbean. United Kingdom. Princeton University Press: 2014, Print. Sporophile, Petit-Chanteur.` Tiaris Canorus Cuban Grassquit. Cuban Grassquit. N.p., 1996. Web. 12 Oct. 2015. Almeida, Juliana B., and Regina H. Macedo. “Lek-Like Mating System Of The Monogamous Blue-Black Grassquit.” Auk (American Ornithologists Union) 118.2 (2001): 404. Academic Search Complete. Web. 28 Sept. 2015. Boal, Clint W., et al. “Insular And Migrant Species, Longevity Records, And New Species Records On Guana Island, British Virgin Islands.Wilson Journal Of Ornithology “118.2 (2006): 218-224. Academic Search Complete. Web. 28 Sept. 2015. Carvalho, Carlos B. V., Regina H. Macedo, and Jefferson A. Graves. “Breeding Strategies Of A Socially Monogamous Neotropical Passerine: Extra-Pair Fertilizations, Behavior, And Morphology”. Condor 108.3 (2006): 579-590. Academic Search Complete. Web. 28 Sept. 2015. Manica, Lilian Tonelli, et al. “Vocal Output Predicts Territory Quality in A Neotropical Songbird. Behavioural Processes” 109. (2014): 21-26. Academic Search Complete. Web. 28 Sept. 2015.